The 2014 season has been dry in many places in Kentucky – corn in these areas not growing as well, or looking as good as desired. Many fields are showing less than optimal color and there have been several calls regarding possible need for more N to ‘green things up a bit’. Without evidence of substantial loss of fertilizer N applied earlier, additional N is not a good idea. Extra N (N above and beyond the recommendation) can do more harm than good – especially if the season stays dry. Every year we see soybeans somewhere in Kentucky with deficiency to potassium (K). Causes for the deficiency can be dry weather, soil compaction and/or low soil test levels for K. For the fields that I visit or receive calls, the reasons tend to be 1) soil compaction, 2) dry weather and 3) low soil test K. The symptoms in this image seem to generate to most phone calls, text messages and emails, which is why I've labeled it number one for soybean. Apparently the recurring theme of the 2014 wheat crop is unusual weather patterns and problems. The delay in wheat maturity and concern for late planting of double crop soybeans provides motivation to consider drying wheat this spring. When to start harvest will depend on the drying system, with typical ranges shown in Table 1. Operators with little experience should start at low moisture levels and ramp up as they gain experience. Use a moisture meter to check grain conditions in the field and during drying, and dry to 13.5 if holding for a few weeks or 12.5% when holding through the summer. Drying air temperatures should be limited to 140 o F for food grade wheat and 110o F if used for seed. 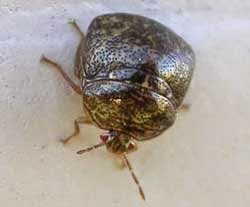 A single adult Kudzu bug was collected on June 16, 2014 from Kudzu at a patch located at ca. KY MM1 on the north bound right-of-way of I-24. No nymphs or eggs were collected. This represents the 1st confirmed occurrence of this invasive pest in the western KY grain crops production area. Adult Kudzu Bug. Photo: Univ. GA. 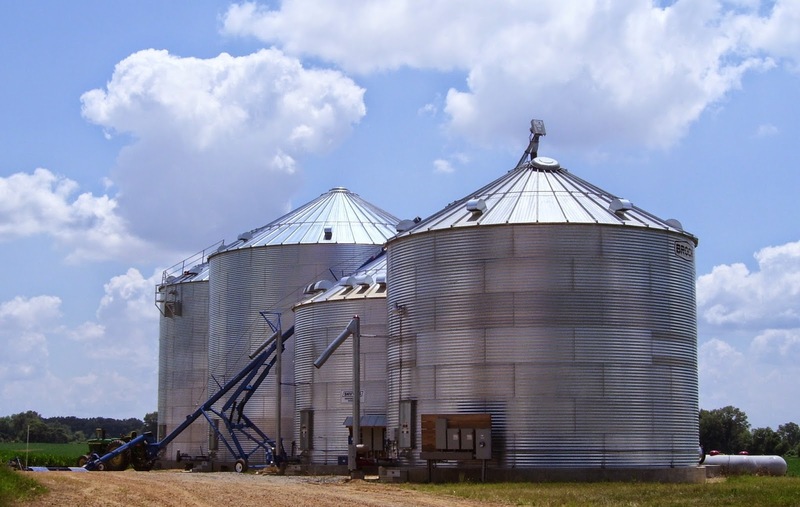 Prepare Bins for Wheat Storage. In just a few weeks a major portion of our 2013-14 winter wheat crop will go into storage of some type. In fact, if this message is prompting you to prepare your bins, you are probably behind the curve. Nevertheless, there is perhaps no more important pest control strategy in successful storage of wheat than bin preparation. Certainly there is no less dangerous and expensive alternative. The following is a suggested check list to insure you have done all you can do to prevent an insect problem in your bins. As discussed in an earlier post, we are seeing a lot of striping on corn leaves this season. Some striping is due to the weather and some due to compaction or a lack of nutrients. 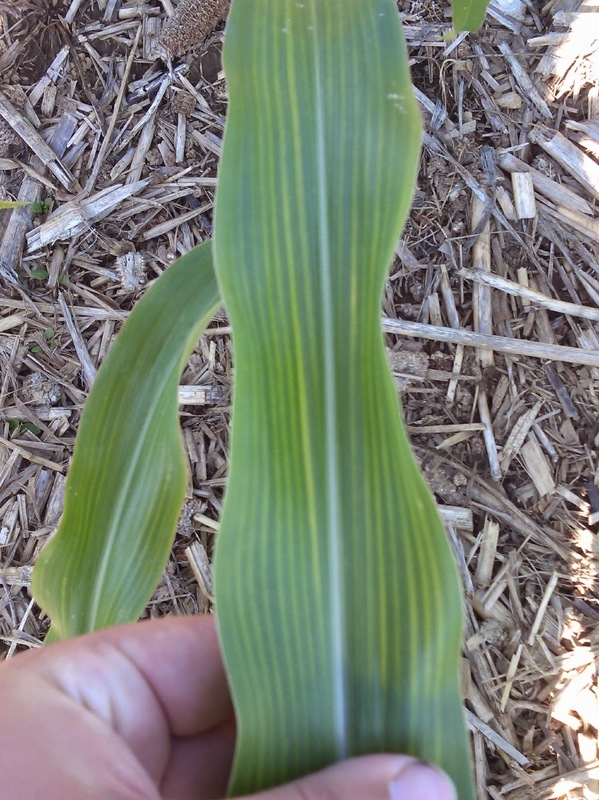 Here is a case where the corn has striped leaves and weather is the most likely culprit. Could Fall Armyworm Be A Threat Now?? It seems completely ridiculous to me to be talking about fall armyworm (FAW) at this time of year in Kentucky. So far we have not detected this insect in our UK-IPM pheromone baited traps at Princeton or Lexington and I have not heard of any detections in TN. Unfortunately, Arkansas is reporting an “outbreak” of this insect, and that gives me a little pause. In most years I would not expect to detect this insect until mid or late July and with the exception of very late planted corn in the purchase region, I would not expect it as a problem until August. Palmer amaranth (Amaranthus palmeri) continues to march across Kentucky. Initially this weed was thought to be present primarily in the west end of the state (Purchase region), but sightings have been reported within several Kentucky counties that border Tennessee and the lower Ohio River in the past few years. Last year Palmer amaranth was found on a farm in Hardin County and two additional fields in Mercer and Garrard counties. 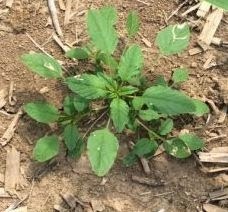 Last week a population of this weed was discovered in a corn field in Shelby County. These sightings would indicate that Palmer amaranth is a growing threat to grain crop production within the state. All spring we have been discussing deficiencies on corn plants and trying to determine if they are to blame on the weather or something else. Below are few fields with some images as examples. Field 1. Striping, but no compaction. This corn in Field 1 is at V7 and has striping that might indicate a deficiency in manganese or sulfur. There is no compaction and all nutrients should be in adequate supply, based on a recent soil test and fertilizers applied. A sidedress application of nitrogen occurred about about a week before these photos. So, a gentle rain and some sun will make this corn "jump" and the striping disappear. I refer to this kind of symptom as a "transient deficiency" meaning that the symptoms are related more to weather than anything else. I have reports of scattered, mixed infestations of European corn borer (ECB) and armyworm (AW) in central Kentucky. Thus far, all infestations are in corn that does not carry insect foliar and/or stalk GMO traits (rootworm traits would not apply). This falls pretty much in line with the timing after increase (but not a dramatic increase) in moth flights in mid-to late May. I doubt that this insect pressure is large enough to be of importance to corn products carrying the appropriate insect GMO traits. Nevertheless, for those folks producing non- (insect) GMO corn, scouting is certainly in order. I have not heard any reports from western Kentucky, but west Tennessee has reported sprays for AW control on some wheat fields. The 2014 Kentucky Extension Wheat Production Contest Rules are available online at the Grain Crops Extension Yield Contest home page. Completed entry forms must be postmarked by July 25, 2014 to be accepted. The Kentucky Extension Wheat Contest began in 1987 and the highest yield that year was 89.10 bushels per acre submitted by Johnny Dawson. In 1997 the contest began providing awards for tillage and no-tillage divisions. In 2013, Jeff Coke of Daviess County produced the highest overall yield of 121.80 bushels per acre. In 2008, 2009 and 2010, a no-tillage entry one the highest overall yield. For the last three years, a tillage entry has won the highest overall yield. If you have questions about the wheat yield contest, please contact your county agent.